This last spring, my classmates Rashauna, Vanessa, and I set out to build the most complex yet compelling visualization we had ever attempted. As graduate students in cartography and GIS, we were extremely motivated to combine our knowledge and skills to see what kind of map we were capable of producing. While the project was part of a final requirement of an upper division course, we had big aspirations for success beyond the scope of the class. We admired the stunning visualizations of the New York Times, Los Angeles Times, Washington Post, and other prestigious news organizations: could we produce something as beautiful and informative? Could we create a visualization that would go viral? We set out to try just that. Our first step was coming up with a topic that was timely, captivating, and original. We knew that the Supreme Court was scheduled to rule on two significant Lesbian, Gay, Bisexual, and Transgender (LGBT) cases in just a few of months (Defense of Marriage Act and Proposition 8). While there were a couple of maps, including interactive maps, that showed change in LGBT state laws, there were none that went back 50 years, incorporated more law categories beyond marriage, and included other forms of visualizations, such as charts. We could not think of a more relevant topic that we felt passionate about, so we snatched the domain 50yearsofchange.com (that title later exploded in use over the summer for civil rights related pieces) and we got to work with brainstorming. We spent hours deliberating on the layout of our application: first drawing on a whiteboard, then moving to Balsimiq, and finally laying out some basic HTML and CSS. Once we were happy with our template, we started on the arduous task of collecting 50 years of data, for 50 states, on six different categories of LGBT related laws (marriage, adoption, housing, hate crimes, hospital visitation, and employment). Many many hours were spent in the university law library and researching various online sources, extracting, interpreting, and coding data. If I take nothing else away from this topic, it’s that the state laws in this country are as varied and complex as its people. The final task in the process was coding. While I was very much a beginner in D3.js at the start of the project, I now feel confident creating custom charts using the library. Programming lasted a few weeks and required us breaking the code into segments to tackle individually. It was iterative and as close to agile development as you might get in a class project. At the beginning of June, after the last lines of code were written, we launched 50 Years of Change and quickly got to work promoting it through social media. Slowly friends and family started reposting and after a few days it was picked up by some fairly well-known map blogs and retweeted by several larger LGBT organizations. The most views for a single day spiked on June 13th, with 1,800 page visits and then slowly trickled down never quite getting above the threshold to go viral. My friend, Marty Elmer, who runs the popular blog Map Hugger, had some great insight in his presentation at the 2013 NACIS Annual Meeting on what makes maps go viral, which Wired then picked up and wrote about in this article. It describes several traits of viral maps, using descriptive titles that are made-up, but catchy. Maybe our map lacked ‘Data Parcity’, maybe ‘Grok-ability’, or maybe people just weren't interested. We will probably never know the true reason, and that is okay. Striving for something big payed off for us, including winning the 2013 Student Narrative Dynamic Map NACIS award, which we were over the moon to receive. We managed to get several thousand hits on our website, hundreds of shares on Facebook, Twitter, and other social media, and interest from a couple of news outlets. I think that is quite good for a class project. I collected some very valuable knowledge through this project, including familiarizing myself with GitHub, new sources for collecting data on laws, creating custom charts in D3.js, and learning how to divide a larger programming task into roles in a group. There are some things I will do differently on future projects as well. First, incorporating an embeddable version of the visualization for people to use in articles, as this was requested and we were not prepared. Second, after seeing the amount of mobile users to the site, incorporating responsive design into the application. Finally, planning for the ability to quickly update the data of the site. The state LGBT laws are changing monthly and this site cannot easily keep up with that. In the end, 50 Years of Change did not achieve virality, but it was complex yet informative and we still consider that a success. A few months back, UW Sea Grant's science writer, social media wiz, and all around awesome communications person, Aaron Conklin, was kind enough to interview me for a feature piece on the UW Sea Grant blog. 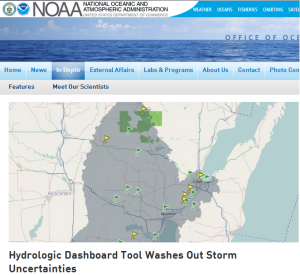 The article is about my experiences at Sea Grant building the Fox-Wolf Hydrologic Dashboard and what I learned from the process. Somehow NOAA caught on to the piece and decided to post it on their Feature Stories site. For a day I was on the front page of NOAA. Thank you, Aaron and NOAA!